Adolf Hitler (Germany: [ˈ adɔlf ˈ hɪtlɐ]; born in Braunau am Inn, Austria-Hungary, April 20, 1889-died in Berlin, Germany, 30 April 1945, at the age of 56 years) is a politician of the Nazi party of Germany and the Chairman (Germany: Nazi party (NSDAP); The National Socialist Workers Party of Germany) the birth of Austria. He served as Chancellor of Germany since 1933 to 1945 in Nazi Germany and dictator (styled Führer und Reichskanzler) from 1934 to 1945. 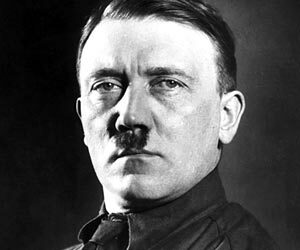 Hitler became the main character of Nazi Germany, World War II in Europe, and the Holocaust. Adolf Hitler was a veteran of World War I with many titles. He joined the workers ' Party of Germany (NSDAP) in 1919, and became head of the NSDAP in 1921. In 1923, he launched a coup in the event known as the Munich Beer Hall Putsch. The failed coup d ' état led by retained Hitler. In prison, writing his memoirs, Hitler's Mein Kampf (Perjuanganku). After 1924, Hitler gained popular support by denouncing the Treaty of Versailles and Pan-Jermanisme, antisemitism, and anti-communism through his speech that charismatic and Nazi propaganda. After being appointed Chancellor in 1933, he changed the Weimar Republic into the Third Reich, a one-party dictatorship which is based on the ideology of Nazism that totalitarian and otokratik. The goals of Hitler is establishing the new order of Nazi Germany the absolute hegemony in mainland Europe. Until then, foreign policy and in his country aimed at attaining Lebensraum ("living space") for the Germanic. He ordered armed Germany Wehrmacht invaded Poland and again in September 1939, led to the outbreak of World War II in Europe. Under the rule of Hitler in 1941, Germany and its European allied forces occupied most of Europe and North Africa. In 1943, Germany was forced to endure a series of self and the defeat in the battle. In the last days of the war, during the battle of Berlin took place in 1945, Hitler married Eva Braun, lover. On April 30, 1945, less than two days later, the two committed suicide to avoid arrest Red Army, and their corpses burned. The Hitler policy supremasis and motivated by race resulted in the death of about 50 million people during World War II, including 6 million Jews and 5 million ethnic "non-Aryans" the destruction of the systematic way ordered by Hitler and his closest colleagues.